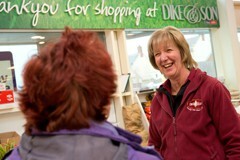 Our award-winning store is huge, which is why we have masses of friendly staff to help you find exactly what you want. 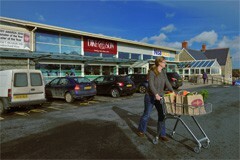 We have a large grocery department, a tempting bakery section, fresh meat and fish counters, a delicatessen and lots of chilled and frozen aisles. And we challenge you to find a better stocked Wines, beers, and spirits department this side of the English Channel. We also sell newspapers and magazines as well as stationery, toys and cards, or you can while away an hour enjoying a traditional home-cooked lunch or Dorset Cream Tea at Williams Cafe. What else Oh yes! We've got two free to use cashpoint machines. One is outside the shop under our covered walkway, and is available 24 hours a day, the other one is next to our Wine area in-store. You can now do your shopping with us online, to do your online shopping click here .